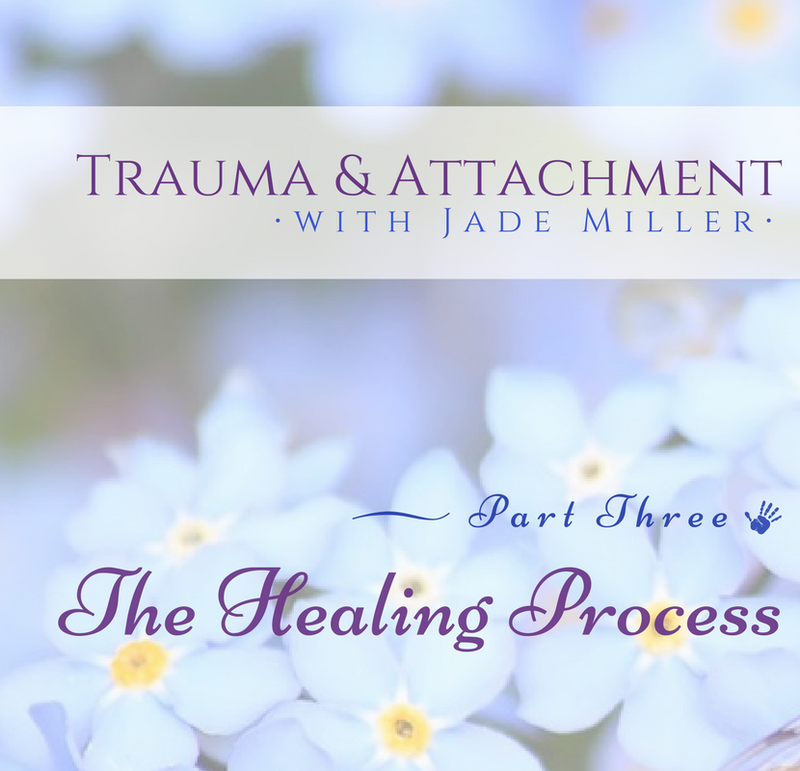 We are so honored and eager to bring to you the third and final installment from guest host and author, Jade Miller, who has created a three-part series on attachment and how it relates to trauma. We have already covered the basics on Attachment Theory, the way childhood trauma affects attachment, as well as our goals for this series in previous articles. If you missed those, we strongly encourage you to go back and take a look; they provide a more comprehensive background that will help make this information more applicable. But, worry not, there's enough review here that you'll still be able follow along if you've only got a minute! Please be sure to check out all the wonderful things you need to know about Jade below! We are truly thankful to her for allowing us to bring you her insights and wisdom, and want you to be able to locate and appreciate all of her other work, too. At this point you may have absorbed the information in this series about attachment styles and trauma and made the realization that you have some unhealthy patterns. In that case, you’re in good company. There are very few people who had healthy enough parents to raise them in an ideal environment that fostered a secure attachment style. There is a lot of information out there on attachment styles and its effect on children and even their lifelong relational patterns. But, unfortunately, there is not as much information on what this looks like in adults or its implications for them. Some suggested reading is the information on adult attachment provided by Fulshear Treatment Center, which can be found here. The good news is, many professionals do believe unhealthy patterns can be changed, and I have found this to be true in my own life. Due to the brain’s lifelong neuroplasticity, neuroscientists believe it is possible to change ingrained thought patterns and learn newer, healthier coping skills. So let’s dive right in to some places where positive change can lead to healthier relationships. Please keep in mind as you read these suggestions that I realize they all sound much easier than they really are. There is zero intent to sound reductive - quite the opposite, really. I’ve been in the position of knowing that these things were a struggle for me, and feeling lost and unsure of how to change. I offer these thoughts in an attempt to simplify it and make it sound more attainable. But I know that there are layers and complexities to these thoughts and behaviors, and that changing ingrained patterns takes a lot of time, attention and, quite often, sheer will. However, it absolutely can be done. The avoidant attachment style has a positive self-image but a negative worldview. So, this person typically does not seek help from outside resources. Their trust in others is low, and they are usually unwilling to be vulnerable or let people come close. People with the avoidant attachment style can work on changing these patterns by practicing taking emotional risks in their relationships. They'll need to learn how to communicate when they are feeling needy or vulnerable, and practice allowing someone to be present with them in those times. Those with the avoidant attachment style have a tendency to believe, deep down, that no one else is safe or trustworthy. This type of thinking will have to be challenged and replaced with a healthier perspective. They can also learn to identify people who display characteristics of true safety versus perceived, and form quality friendships where they can start to practice letting those people see their real selves. The anxious attachment style presents with a negative self-image but a positive worldview. This person usually seeks help from outside resources but they have few internal resources upon which to draw. They trust others – oftentimes a bit too much – but they haven’t developed very much trust in their own self. They are often described as needy, clingy, and codependent. People with an anxious attachment style can start to find ways to feel secure within themselves, without needing constant contact with others in order to feel like they are okay. One way to do this is to work on improving their self-esteem. They will need to intentionally set out to learn what is important to them as an individual and why they are valuable as their own person. They require practice in valuing their own selves equally as much as they value the needs and expectations of others around them. Allowing others to become a complement to their independent and secure selves is where they'll find their healthiest relationships. The disorganized attachment style has the double whammy: a negative worldview and a negative self-image. In short, those with a disorganized attachment style will require help changing both of those things. Some of the strategies for each of the other insecure attachment styles may be helpful, but often people with disorganized attachment styles have underlying trauma that needs to be addressed before those changes are truly feasible without causing more unexpected distress. While those with each of the insecure attachment styles would benefit from therapy, those with the disorganized attachment style may be most in need of the extra support. Changing one’s self-image and one’s view of others to a more positive outlook can be challenging all on your own. Without an anchor point on at least one side of a relationship, it can extremely hard to determine for yourself what a safe, healthy and balanced relationship would even look like -- let alone trying to go about achieving it. A therapist who is educated in attachment theory can help those with a disorganized attachment style to work through attachment-related traumas and make progress in attaining a healthier self-image and a more positive view of others. So, we have come to the end of our series on attachment and trauma. We know this information can be a lot to digest, and even very painful. Having to uncover all of the ways in which you may have been disadvantaged before you even had a chance, can be such an emotionally-charged experience. Allow yourself the permission to grieve those things; to be angry, upset, and sad about them. Yet, on the flip side, we sincerely hope we've also been able to provide you with clarity, understanding and even real hope. Sometimes, just knowing what you're up against, and to have someone explain to you why all the changes you've been trying to make may not have been the most successful, it can be relieving and even alleviate self-blame. And, knowing there are real things you can do to change how you see yourself and the world around you - that it doesn't have to feel so chaotic and confusing all the time - can present a real opportunity for feeling optimistic. And, we know how hard optimism can be for so many of you! We want to thank Jade for all of her hard work on this series. Not only did she bring to you the best-researched information on this topic, she did so having gone through this exploration herself and wholly empathizing with every way this can be difficult and painful. ...but also knowing it is ultimately really worth doing. We hope you have found this series valuable, and if you have, please be sure to let Jade know below, or find her on her various platforms to pass along the appreciation (or questions!). We are also glad to answer any of your questions, so don't hesitate to ask! Thank you, Jade, and to all of you who brave the hard task of facing the things that are difficult head on, and working to make those positive changes in your life. You are a beacon of light to us all. Jade Miller would describe herself as a blogger, artist, SRA survivor, peer worker, and member of a poly-fragmented DID system. ..who also desires to bring education and awareness about the reality of SRA/DID to the public and increase the number and availability of resources to survivors for healing. We would firmly agree, and also add that she's a fantastic advocate, with an abundance of passion, knowledge and experience of which we can all benefit. Her blog is not only an invaluable resource, but she's also a published author with some must-read material. Notably for survivors are her two illustrated books for younger parts of DID systems called Dear Little Ones and Dear Little Ones (Book 2: About Parents)! You can even listen to her read it on YouTube, and see the illustrations. She's also written books on Attachment and Dissociation, and has also compiled her experiences of struggle and healing into more personal books in the past. All of these are very well worth your time, and we strongly encourage you to seek out all of her published work as well as her online presence (listed below). We are super honored to partner with her to bring you this series and deeply value her support to us, and to survivors everywhere! FIND JADE ON ALL HER PLATFORMS! We are so excited and honored to bring to you yet another meaningful guest article - this time authored by therapist Sarah Flynn (MREM, MA, RCC), and coming to you all the way from Canada! 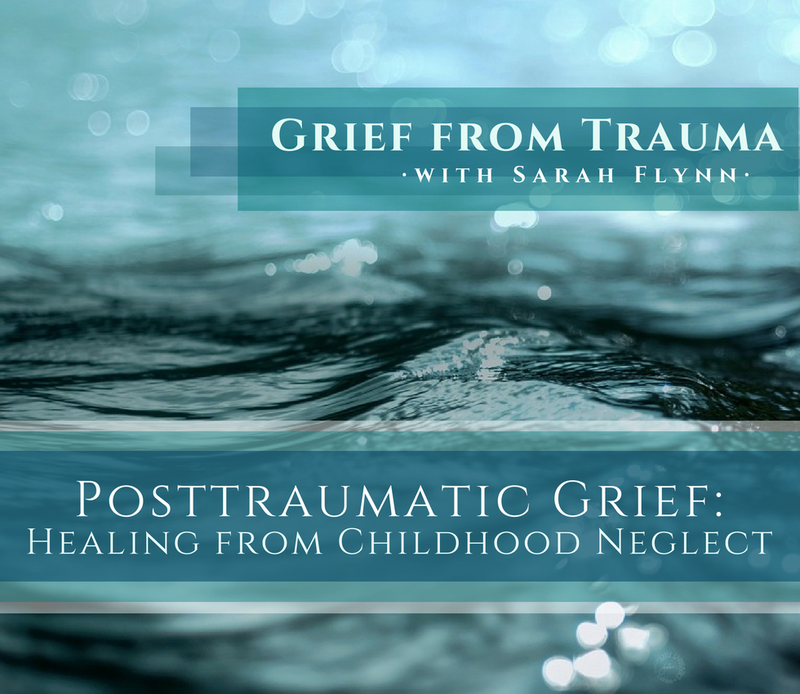 In this, Sarah compassionately addresses the often-overlooked grief that can stem from a childhood missed out on, or lost entirely, due to ongoing trauma. Grief is so often thought of in a much different context, yet survivors so frequently feel this deep, painful ache and/or longing that most struggle to even find words for or verbalize. It's grief. And, this article lovingly and thoughtfully walks you through that realization and validation. Sarah has been a lovely and very helpful individual to get to know, and the information she brings to the trauma community is invaluable. Be sure to read more about her below and visit all the places you can find more of her work! Most people think of grief as a response to the loss of a loved one, but grief can be a response to any type of loss, including the loss of something that never was (such as a happy childhood). This post explores the experience of grief in the present as a response to having bad experiences (from abuse, neglect, or trauma) in the past as a child. Grief of this sort is a necessary and restorative process that permits a person to bring new life and a renewed sense of hope to childhood hardship and deprivation. Looked at in this way grief allows us to cleanse ourselves of hurt and loss and continue to grow and to expand our sense of ourselves. Many people do not realize that they may be suffering in the present from having been mistreated, deprived or traumatized as a child. Partly this is the case, because it is hard to know that something is missing if one has never had the experience of its presence. If you did not have loving, attentive, nurturing parents who were joyful about life and about you as their child, you might not know that this is something that you lacked. If you were emotionally abandoned or neglected, you may not know what it is like to be emotionally accompanied or cared for. Often a person does not begin to grieve their childhood losses until they have reached a point in their lives where in they can emotionally afford to do so. This may be because the person has found a therapist with whom they feel safe enough or because they find themselves with a social support system that is stable and strong enough for the first time. The self-compassion borne out of grieving the losses of your childhood makes it clear that you did not deserve the abuse or neglect that you suffered and that you are hurting now because you were hurt then and not because you were bad then. If you were neglected or abused as a child your emotional or intellectual development may have been truncated. This may be because you needed to use your energy to protect yourself rather than to grow and develop naturally emotionally and intellectually. There may not have been opportunities for you to participate in normal, age-appropriate activities such as playing, asking hundreds of curious questions, using your imagination, experimenting with language and cause and effect, or getting to know yourself and your own emotional internal world in an intimate way. Moreover, these losses and the feelings of grief associated with them may have been unacknowledged or even actively denied by those around you. In some cases the lack of acknowledgement of loss can be more emotionally devastating than the loss itself. The grief associated with unacknowledged childhood loss may be outside your awareness, but actively affecting you to this day. has several articles on dissociation and complex trauma on her website. 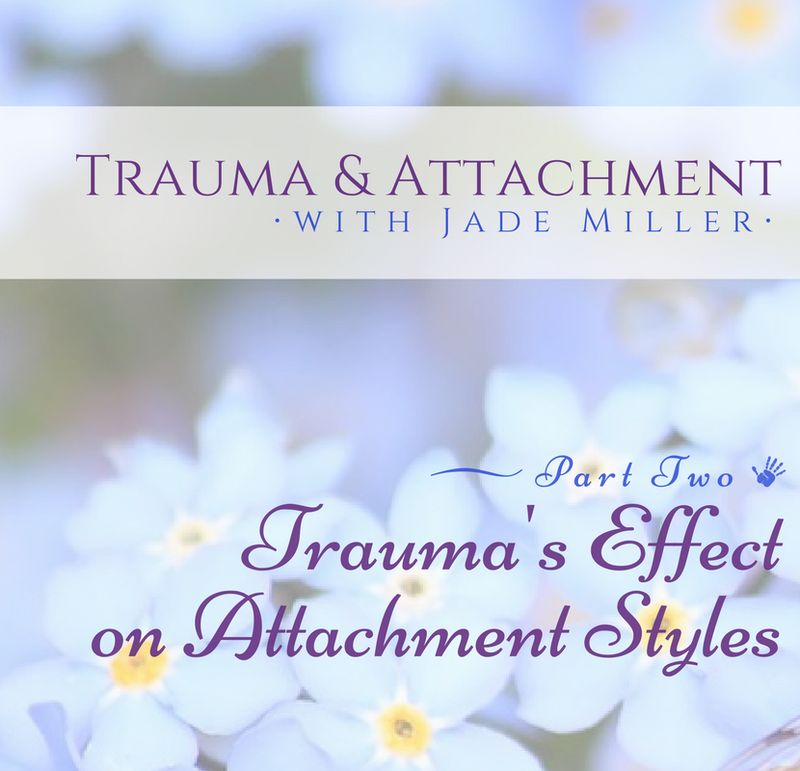 We are so honored and eager to bring to you Part Two from guest host and author, Jade Miller, who has created a three-part series on attachment and how it relates to trauma to share with you. If you missed the introductory article on Attachment Theory, as well as our goals with this series, you can check it out here. But, fear not! There's enough of a recap here that you'll be able follow along if you've only got a minute - though we still encourage you to go back when you have time. So, let's just jump right into it! Please be sure to check out all the wonderful things you need to know about Jade below! We are truly thankful to her for allowing us to bring you her insights and wisdom, and want you to be able to locate and appreciate all of her other work, too. Secure attachment occurs when a caregiver consistently and appropriately meets a baby’s needs over a long enough period of time that the baby learns to expect a compassionate response. This causes them to internalize the belief that the world is basically a good place, that they themselves are worth caring for, and that others are willing to meet their needs. Insecure attachment occurs when – for any reason – a caregiver is incapable of or unwilling to meet a baby’s needs predictably and in an appropriate way. Babies interpret this in slightly different ways, depending on their unique personality, and thus can result in one of three types of insecure attachment. But the bottom line will be that their view of the world, themselves, and/or others is negatively affected. In this post I’m going to share how trauma affects people differently based on their attachment styles formed in infancy. To put it very simply, trauma occurs when something happens to someone that is beyond their ability to process it in a healthy way, so the experience is not integrated correctly on a physical, emotional, or neurological level. (Some people prefer to understand it in terms of emotional and even physical energy that becomes trapped in the body with no way of being released.) In most cases, trauma happens when a person perceives a threat to their life, bodily integrity, or sanity. It’s important to understand that the factors that cause an event to be experienced as traumatic are unique to each individual. No two people are the same, so even those who experience the same event (e.g. a natural disaster, or siblings who witness domestic violence in the home) may react to it differently according to their unique biological makeup as well as their individual personalities and sensitivities. People who are lucky enough to have a secure attachment to a caregiver as infants/children are at a significant advantage when it comes to experiencing a traumatic event. Sensitive caregivers are available and able to help them process the trauma so that it becomes appropriately integrated in their bodies, minds, and emotions. When a person experiences trauma, but has a secure attachment to someone, that attachment can restore their sense of security and counteract the effects of the trauma. When a child experiences something potentially traumatic, they seek comfort from their attachment figure. Secure attachments help children regulate emotional arousal that occurs in the face of a threat. Later, the attachment figure will help the child form a narrative about the event so that the brain can adequately process it. Rather than the event becoming stuck in the right brain as just experience and raw sensory data, a sensitive caregiver will help the child contextualize and understand what happened - which is one way of bringing the trauma into the left brain, synching the two halves, and helping the mind integrate the experience. Here is an example: Suppose a child is playing on the playground in the park, and suddenly a person walks by with an aggressive dog on a leash. The dog sees the child and lunges toward them, barking and growling, before being pulled away by its owner. A child with a secure attachment will most likely run to its caregiver, crying, and the caregiver will pick up the child and comfort them. A sensitive and empathetic caregiver might say something like, “Wow, that must have been so scary! I’m sorry that dog scared you!” They will comfort the child by holding or hugging them until the child is calm. The very best way of helping a child integrate the scary experience they just had would be for the caregiver to actually put the experience into narrative form. They may say something like, “You were playing on the playground and then a big scary dog came by and barked at you. It scared you really bad. Then you came running over to Mama and I hugged you until you felt better.” The brain’s memory bank is sometimes described as an elaborate filing system. And, trauma has the potential to become stuck in a separate part of the brain, instead of being filed correctly. Forming a narrative helps the child make sense of what happened to them so the brain knows how to file the memory appropriately and can then “close out” of the “file,” so to speak, once it understands. With very young children, they may need to talk about the event and hear the story repeated over and over before they are able to finish processing it. If a person without a secure attachment relationship experiences trauma, the event is more likely to remain unprocessed and unresolved from an emotional, physical, and neurological viewpoint. The person is often unable to regain their sense of safety in the world and may experience the threat of trauma as ongoing, even after the actual threat has subsided. In the face of unrelenting hyper-arousal, dissociation is often next in line as the person attempts to cope. It’s important to understand that without a secure attachment style, an overwhelming event is more likely to be perceived as trauma, no matter whether the person is still a child or not. People who grow up securely attached have developed much-needed skills to help them process overwhelming events and reduce the likelihood that they will become traumatized by something. However, this does not mean that securely attached people are never traumatized. It simply means the risk that something will be experienced as traumatic is lower, and the amount of time it takes for them to recover from a genuine trauma is often less than those with insecure attachment styles. People with an insecure attachment styles do not have a healthy template with which to relate to others, the world, and themselves. They are more likely to experience something overwhelming as a trauma, because they lack the internal (and often external) resources with which to process it. Below are the tendencies of each insecure attachment style in how they cope with emotional distress (traumatic or otherwise). People with an avoidant attachment style often see other people as a source of apathy, fear, or discomfort. So traumatic experiences do not drive them to seek help from others. Rather, they withdraw internally even more, and attempt to utilize their own resources to cope with an overwhelming event. Many attachment experts theorize that people with this attachment style are more likely to develop addictions. Those with the avoidant attachment style see people as a source of indifference or distress rather than a source of help, so they turn instead to ways of comforting themselves that do not involve other people. People with the insecure attachment style see other people as a helpful resource, but their low self-esteem creates a seemingly bottomless void of need. These people are often drawn into co-dependent relationships because they see others as their only source of comfort and soothing. They have not internalized the ability to self-soothe because their early interactions with caregivers were inconsistent or confusing. They did not receive comfort consistently enough to learn how to comfort themselves, so they feel the constant need for contact and connection to others when they are overwhelmed. In the example of the child on a playground, lunged at by a big scary dog: those with insecure attachment styles, if faced with the same situation, could be at risk of a lifelong phobia of dogs. Or, they could be triggered to an anxiety attack by the sound of a dog barking or growling. The fear and panic they felt then, if experienced as trauma and left unintegrated, could cause all kinds of symptoms in their adult life. Stay tuned for Part Three of the Trauma and Attachment series, coming soon! We are so honored and eager to bring to you guest host and author, Jade Miller, who has created a three-part series on attachment and how it relates to trauma to share with you here. We know the words 'attachment theory' can sound foreign or intimidating to those without a psychological background, or even sound like something that doesn't really pertain to you or matter much. But, it truly does, and our goal throughout the series is to demystify it in a way that is very approachable and can teach you valuable things about yourself and your healing. It is so helpful for survivors (especially those with C-PTSD and Dissociative Disorders), as well as their loved ones and supporters, to truly understand the complexities and nuances of attachment, because they play such an integral role in how these disorders come to be and why they're so multidimensional beyond just the PTSD. While the trauma itself is disruptive, it's the attachments we have not only to our perpetrators but with everyone else on the outside that further impact how we internalize that trauma and how we view the world around us. We truly hope this series is both enlightening and helpful as you continue on your path of understanding and wellness. And, we are truly thankful to Jade for allowing us to bring you her insights and wisdom. Please be sure to check out all the wonderful things you need to know about her below! Attachment theory is the theory that humans are born with an innate tendency to seek care, help and comfort from members of their social group when they are facing overwhelming danger and/or are in physical or emotional distress. The group of behaviors used to solicit caregiving behaviors from others is known as the “attachment system.” In infants, the primary attachment-seeking behaviors would include crying, and (when old enough) what is known as an “approach” method - which seeks physical closeness to, and comfort from, the attachment figure. (The attachment figure is usually the mother and father, but can sometimes be another relative or whoever takes care of the baby’s physical and emotional needs most often.) If you’ve ever had the chance to people-watch in a place where there are children, you’ll probably notice that very young children stay close to their parent. And if they do venture away – on a playground, for example – and something scares them, they will run or crawl quickly back to their parents. This “approach method” is an attachment-seeking behavior. The opposite of carrying out an attachment-seeking behavior is trying to “avoid” something in the environment that is perceived as threatening. Attempts to avoid a threat usually involve the baby either ignoring it or actively seeking distance from it, rather than trying to approach it. The behavior of approaching a caregiver when distressed is simply part of our survival instinct as a species. 3) the attachment system is powerfully activated during and after any experience of fear and of physical or psychological pain. This is why it matters so much in relation to trauma. So now that you know what it is, let me briefly describe the types of attachment that can be formed, depending on those crucial early interaction patterns. To break it down for you, there are 2 types of attachment: secure and insecure. Secure attachment is (or should be) the goal of all parenting behaviors and interactions between mother/father/caregiver and child, from birth to independence and beyond. Securely attached infants develop positive, healthy, and relationally-effective internal working models (called IWM’s by the psych folks) that become the blueprint – or software, if you prefer – for the way they interact with people and the world at large, generally speaking, for the rest of their lives. It also affects, to no small degree, their perspective of themselves and their own lives. The securely attached infant’s IWM is based on the belief that the world is a good place and the infant is a good person; they are forming the belief that others are capable of and willing to meet their needs, and that they are worthy of having their needs met. Securely attached babies may express distress when they are separated from their caregivers, but they readily accept comfort when the caregiver returns to them. Insecure-avoidant is the infant that may appear content – or even indifferent – in regard to their caregiver. Sometimes these infants are even mistaken by people unfamiliar with infant development for securely attached children because they do not react to separation from their caregiver. They do not react to reunion either; they appear indifferent to their caregivers’ presence or absence. The truth is that these infants have closed themselves off to the world. Their IWM summary – if they were able to think abstractly – would be “the world is a bad place but I am a good person, so I will shut out the world.” They do not turn to other people for help or comfort. Brain scans of these babies, when placed in a situation that would normally cause distress, show that despite the fact that they do not cry or fuss, they truly are distressed and their level of distress – as shown by the brain activity on the scans – is the same or greater than their peers who are securely attached (or insecurely attached but in a different subgroup); they have simply learned to suppress it. They don’t actively seek caregivers’ attention. They turn inward and search for internal resources and solutions that do not involve other people. Insecure-ambivalent is the infant that seeks their caregivers’ attention when distressed, but is not readily comforted despite their caregivers’ attempts to do so. Their IWM would be summarized: “The world is a good place but I am a bad person, so external comfort cannot help me.” These infants exhibit attachment-seeking behaviors but when the caregivers try to comfort them, it takes much longer to calm them down, if calming can be achieved at all. They seek outside help but simultaneously view such help as ineffective. Insecure-disorganized infants have not managed to organize their reactions in any enduring way. Sometimes they appear avoidant, sometimes they appear ambivalent, and other times they appear secure. Their reactions to separation or distress are unpredictable and un-enduring over time. These infants’ IMW would be summarized thusly: “The world is a bad place and I am a bad person, there is nothing I or anyone else can do to help me.” They are unpredictable and seem confused. They sometimes exhibit both attachment-seeking and avoiding behaviors simultaneously or in rapid succession, as if they are trying to pursue two incompatible goals at the same time. They do not seem to know what they want or how to get it. Attachment theory is a topic that I am very passionate about, because I believe the early blueprints we develop, which become our beliefs about the world and ourselves, inform every future relationship we have with others and even ourselves. A person’s attachment style, and the availability of healthy people with which they can bond, profoundly affect the impact a traumatic experience will have on someone. I will write more about that in the next blog post. If you want more in-depth history and discussion of attachment theory, the research is plentiful and easy to find. If you don’t like any of those links, Google “attachment theory” or “John Bowlby” and/or “Mary Ainsworth” and you will have an abundance of reading material. Their methodology for establishing the foundation for their theories is also available, which I’m not going to discuss here because it’s not pertinent to the material at hand and I’m already attempting to condense plenty of information. If you do want a breakdown of the methodology, Google “The Strange Situation," in conjunction with Bowlby/Ainsworth. In the next post I will talk about why attachment style matters and how it affects a person’s response to a traumatic experience. But, for an inordinate amount of the population? Family is anything but merry, warm or inviting. It’s the source of pain, and loss, abandonment, and grief. It’s abuse and yelling, belligerence and guilt-tripping. In countless tiny corners, there will be an adult survivor of child abuse wrestling with themselves, tearing out their insides, trying to decide if they should answer their mother’s text. Another will have agreed to come to the Christmas dinner only to immediately regret it, and now there's no way out. Another is dessssperately waiting for their family to invite them — anything to show that maybe they care. Maybe they weren’t forgotten. Maybe their family actually wonders if they’re alive or not. The fact of the matter is that all over this globe are trauma survivors with families that are incredibly toxic. They are not to be welcomed with open arms. They will require courage of steel just to share the same room. And, some shouldn’t even be spoken to, let alone ‘kissed and made up’ with. Right now, there are survivors everywhere wishing they could have the family others have, and are messily scrambling to figure out how they're even going to be okay. ...and WHAT on earth they are going to do. 1.) Remind yourself immediately you are allowed to set boundaries. 2.) Beware of the wolves in sheep’s clothing. Holidays are a prime time for reflection and fuzzy feelings — they get the best of all of us sometimes. They can make even the baddest of people soften their edges and become just sooo very warm and inviting. As a survivor of abuse or toxic family dynamics, it can be incredibly hard to resist. That hurt, little you desperately wants them to mean what they say and to feel their affections. It’s all you’ve ever wanted. And they seem so sincere! “This could be the year!” And, it really could be. Bad people can change, and amends can be made. But if those amends couldn’t wait or you know they wouldn’t be made outside of the holiday season, beware that their intentions may not be so pure. If they don’t wanna work anything out and speak to you about things before the holiday - or they're deeply offended by you asking to wait until after the busy season to strike things back up - they may not miss you as badly as they say they do. They may be toying with your heart. …again. And it’s going to be so hard to resist. That’s to be expected. It’s even entirely understandable because it comes from that beautifully innocent place in you that exists in all of us. It’s out of the purest kind of hope — and it’s one that we don’t want to see get crushed by their hurtfulness. If you know that your toxic family member has a tendency to turn on the charm during holidays or special events, and they're trying to lure you into holiday celebrations, convince you they should come stay for awhile, or just reeeeeally want to see you all of a sudden? You may need to label this fluffy little sheep as the wolf they’ve always been. Run it by a friend, see if they get the same warm feels you do. If they don’t, trust their intuition if they respond saying they don’t wanna see you get hurt. If it’s meant to be, your family member will be there when the holidays pass. If not, returning their messages now may just be returning yourself to being abused again. You don’t deserve that. You never did. 3.) Take time to grieve. For some of you, your abusers may have passed on. And for others, it's the idea of a happy, healthy family that is long gone and passed. There is also the mourning of a childhood that was robbed of some of the simplest holiday joys, which can rub your heart raw as you celebrate as an adult. Holidays can bring up so, so much grief whenever it feels like something extraordinary is missing. For those with toxic or abusive families, there was always something vital missing. And, as we get older and lose people in our lives, the grief of loved ones no longer here can compound all these losses into one, soul-crushing ball of pure pain. If the person no longer alive was an abusive family member, you may even find yourself additionally vulnerable to a flood of traumatic memories, too - not just the grief. Memories may feel “safer” to reveal themselves to you now that the person is no longer alive or a threat to you. The same can be true even if you only set firmer boundaries and closed doors on relationships. They may not have passed away, but a book has been tightly closed and your mind can feel a little sturdier to go back and flip through some of its pages. If you know this is a possibility, labeling it for yourself ahead of time will spare your poor heart and mind a great deal of added anguish. The holidays are as much about reflecting on old memories as they are about creating new ones. But, for trauma survivors, we think the emphasis should be sooo much heavier on creating new ones. Now is the time to do all the things you wanted to as a child but weren’t allowed. Play with kids' toys. Make a lot of noise. Run through the house. Indulge in an extra dessert if you never let yourself do so. Watch the movies you wanna watch, invite ONLY the people you want to invite, go to the parties you wanna go to, and stay home in PJs and slippers on the nights you wanna stay in! This holiday can be 100% yours - finally! Your life is invaluable and you should spend it how, and with whom, you are most happy. You might not have an Ugly Christmas Sweater family portrait with all the cousins and in-laws to post on Facebook, but you also were spared a bunch of awkward conversations, backhanded compliments, and most likely being made to feel like a lot less than you're really worth. You deserve to do things on your terms. And for once that doesn't have to include anyone yelling at you; telling you all the things you messed up; shaming your job, or your weight, or your partner, or your house. No fighting, no guilt-tripping, no violence. You get to redefine what this Christmas/Hanukkah/etc means to you. You get to rewrite what your New Years Eve will look like. You also get to start a fresh new year! And, guess what. Good news is you don’t have to wait for a new year to start living for, and honoring, you. START RIGHT NOW! Make new memories. Meaningful ones. So many new ones you can't even keep track! 5.) Celebrate every small victory. In closing, we know this is an incredibly tough time of year for so many more reasons than just these. We’ve even made a guide to surviving the holidays with C-PTSD that tackles the other ways this season can be far too much to take. We encourage you to read that (or read it again!) just to recharge yourself. That way you can feel as if you're able to head into these upcoming weeks with a clear head, a bundle of deep breaths, and a game plan to guide you through. We are thinking of you and sending our utmost compassion out to all survivors everywhere. And we're asking others to do the same! May you never feel forgotten or unseen. And, may your holidays be safe, and wonderful, and special to you.